The quail egg. Adorable! They are like real life little cadbury eggs. They’re pretty ubiquitous here in Argentina. I’ve seen them at many markets and verdurias, but I’ve always shied away from them. Quail eggs are a bit of a delicacy in the US. I once had an appetizer topped with a quail egg at a Gourmet Latino Festival in NYC and immediately thought “ooo fancy!“. So I suppose when I’ve seen them I’ve thought they would be too expensive or they’re too fancy for the dinner I was cooking that night. On top of that, I didn’t really know what was involved in cooking them. But I was raised in a house, and now live in a house, where we were always trying something new, taking a culinary adventure. I eventually just got over my preconceptions, and bought a dozen eggs. I wasn’t quite sure what I was going to do with them, but it seemed like a great time to experiment. 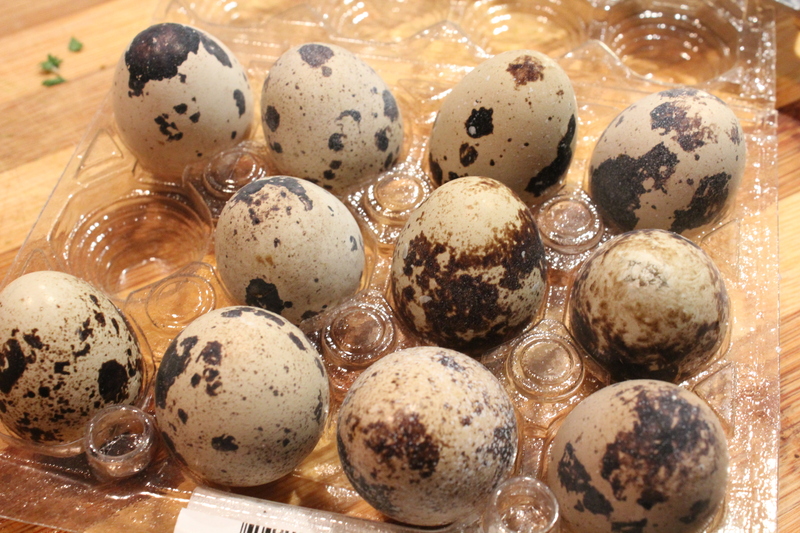 Some interesting and surprising facts about quail eggs and why they are awesome! There is a nutrient party in each adorable, little egg. Each quail egg contains 3 or 4 times the amount of vitamins and minerals than chicken eggs. They are a good source of vitamin B1, iron, potassium, and folate (among other things) and they contain the same amount of cholesterol per weight as chicken eggs. You don’t have to worry about salmonella! Quail eggs are resistent to infections. This means, if you so desire, you can eat them raw. Source: E-Hows article on quail eggs, but also a quick look through the interwebs to back up their claims. But how do you cook quail eggs? As I said above, should you choose, you can eat these bad boys raw. Otherwise, you can cook quail eggs just like chicken eggs, just with slightly less cooking time. You can fry them, poach them, or boil them. You can put them in other foods and I imagine you can scramble them as well, but you probably would have to use a LOT to get a real meal there. Soft boiling quail eggs. I had a big hunk of salmon from the fish market and decided that the quail eggs would be perfect on top. 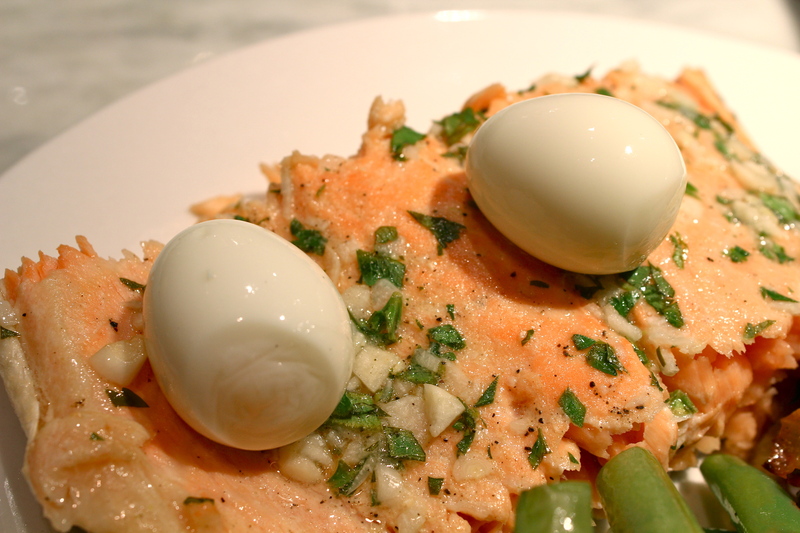 Think smoked salmon with a poached egg, one of my favorite brunch foods. I wanted the white solid but the yolk liquidy like a poached egg, but I’ve never poached an egg and wasn’t about to start with these little guys. So I decided to go with the healthy and delicious soft boil. Here’s how I did it. Fill a pot with water and bring it to a rolling boil. While the water is heating up, prepare a bowl with a bunch of ice and cold water. Just like when you blanch something, the ice cold water will help stop the cooking process so that the egg yolk will have the perfect consistency. I like to put the ice in the bowl and wait until the last minute to fill it with water. That way the water is colder. Gently place the egg in the boiling water, either bye dropping them one by one or by putting them in a slotted spoon and lowering them into the boiling water (I did the former, but I imagine the latter would be safer and easier). Note that the extreme temperature change when putting eggs in boiling water will probably cause some of them to crack a bit. Normally I would put eggs in cool water and then bring them up to temperature with the water. But these eggs are so small that you can’t cook them for that long. Plus quail egg shells are pretty strong so it’s not that big of a deal. The total cooking time for the eggs is really 2 minutes. But I have found that if you cook them on a burner for the entire 2 minutes, by the time you drain them and get them in the ice water, they are over cooked. Remember that the cooking process doesn’t stop once you turn off the burner or even once you drain the liquid. Its still cooking until you get them in the ice water. So what I did was: Cook the eggs for 1 min 30-40 seconds. Turn off burner. Drain. Immediately put into a bowl of ice water. This way I don’t have to rush so much and have less of a chance of totally breaking an egg or falling over myself with a pot of boiling water. Let the eggs sit in the bowl with cold water running over them for about 30-45 minutes until they are completely cool. (Clearly the water shouldn’t run for 45 minutes. Just until the eggs can sit in there without the water warming up.) Then peel away! The yolk to white ratio is much bigger here, so, especially if they are soft boiled, you will need to be careful while peeling or you may cause the yolk to pop open. For some extra fun, this was our dinner the other night. Super simple, super yummy, super healthy. Lots of olive oil, but those are good fats! Heat the oven to about 375. Lay down a large stretch of aluminum foil. The sauce is made with minced garlic, minced parsley, salt, pepper, lemon juice, olive oil and just poured this over the salmon and gently rubbed it in making sure the whole fish was covered. 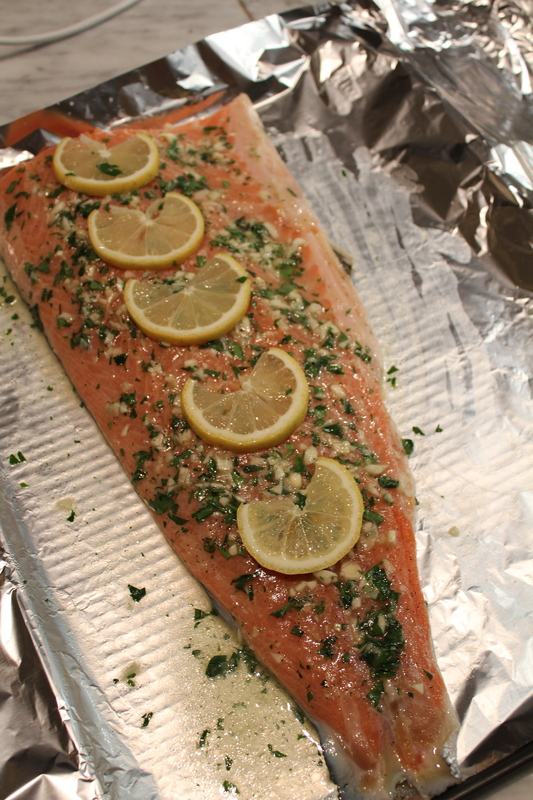 Lay thinly sliced lemon down the center of the fish. Lift up the long edges of the foil, bringing them together and then folding over until almost touching the fish, but not too snug. Fold up the sides of the aluminum so that the steam is locked in. Cook for about 10 minutes then open up the foil and allow to cook for another 5 or so minutes until it’s flaky but not dry. 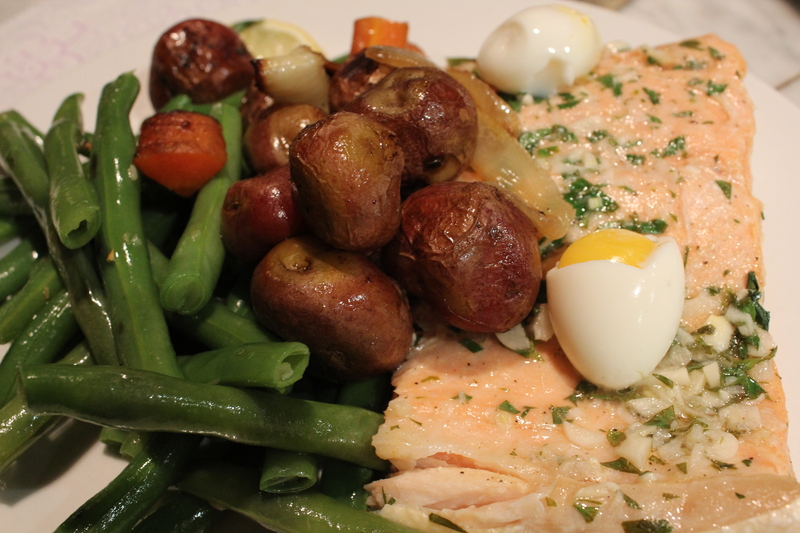 So here was our dinner all together: Roasted carrots, onions, and mini baby potatoes (seriously, they look not that mini but they are just larger than a large marble), sauteed green beans, and the baked salmon topped with soft-boiled quail eggs. Looks fancy, but is really a low impact meal that took about an hour to make. Yummy, thank you for including your recipes! Ryan loves quail eggs so this would be his dream dinner! Oh man I didn’t know he like quail eggs! I’ll have to send you/him this other recipe I found for crispy deviled quail eggs.